Woo hoo. Love a parade, especially small ancient neighborhood ones. 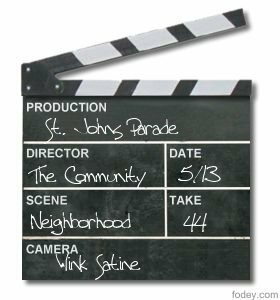 And this Saturday is the St. Johns parade, the harbinger of Portland's Rose Festival, really. The parade steps off at noon, and has 90 entrants. Am quite tempted to load Wink into the big yellow gardening cart (The Hummer) and march in the parade, but I think we'll save that for Pride. I blogged about it last year, check out the Shriners! I love small ancient neighborhood parades, too, where all you have to do to be in the parade is pop on a Burger King crown or load your dog into a garden cart. But the big question is: Will there be clowns? It's a gardening cart, people. GARDENING CART. But it's huge. And it's bright yellow. Therefore, we call it our Hummer. What? Do I have to post a picture?!?!?! OY, what people will read.